What do spiky red blood cells have to do with neurodegeneration? The work of Prof Lucia de Franceschi at the University of Verona and Prof Giel Bosman at the University Nijmegen Medical Centre has just been published in the internationally- recognised journal “Blood” (see doi:10.1182/blood-2011-05-355339): Erythrocyte membrane changes of chorea-acanthocytosis are the result of altered Lyn kinase activity. In May 2002 the First Symposium on Neuroacanthocytosis heard the speculation that functional anomalies in band 3 of cell membranes may be involved in generation of acanthocytes. The earliest research commissioned by the Advocacy began the exploration of the cause. The first step was a small project conducted through Mount Sinai Medical Center in New York where Ruth Walker is Associate Professor. With the financial support of Carl and Betty Pforzheimer, blood samples of patients were analysed by Prof Bosman at the University Nijmegen Medical Centre, Nijmegen, The Netherlands. 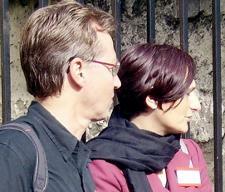 Prof. Bosman’s work continued in collaboration with Prof de Franceschi at the University of Verona, Italy. This work received support from foundations of the Leonard Blavatnik Family in 2008. The investigation was incorporated into the European Multidisciplinary Investigation into Neuroacanthocytosis (EMINA). Profs de Franceschi and Bosman report that the significance of their investigation is a novel mechanism for generation of acanthocytes in ChAc. Using an integrated proteomic approach, the researchers found 'instability' of band 3 junctional complexes bridging the membrane to the cytoskeleton of ChAc red cells. The research found increased tyrosine-phosphorylation of band 3 together with several membrane proteins leading to altered linkage of band 3 to the junctional complexes in ChAc red cells. The researchers then looked at the signalling pathway towards band 3 and found abnormal activation of Lyn, a kinase from the Src family, independently of the canonical Syk-mediated pathway described in red cells from healthy donors. Future studies are planned to study the Lyn-related signalling cascade in ChAc red cells and in other NA disorders by integrated and functional proteomic approaches. Lyn and Syk as tyrosine kinases belong to the larger class of protein kinases which attach phosphate groups to other amino acids. They function as "on" or "off" switches in many cellular functions". Phosphorylation of proteins by kinases is an important mechanism in communicating signals within a cell and regulating activity of cells such as circulating red blood cells or stationary nerve cells.